I make homemade sweetened condensed milk because most commercial brands contain high fructose corn syrup and are high in sodium. I love to use this recipe in my baking, it makes my cookie bars moist and delicious! Mix all of these together in a small sauce pan. Simmer for a few minutes, just until everything is well heated. Take off of the heat and allow to cool. This is best used right away, but will keep in the refrigerator for a few days. Note: Don’t freeze this homemade condensed milk – the cellular structure will break down and it will become watery. Milk powder – You can substitute buttermilk powder or goat’s milk powder. I haven’t tried soy powder or any nut powders for vegan options, but they may work. You may need more water if you use one of these options. Sugar – I’ve used raw cane sugar with great results. The mixtures are darker in color, but if you’re making bars, the color shouldn’t matter. You can also try other sugars such as palm or coconut. They should work equally as well. Honey and molasses will also work, but you may need to decrease the amount of water. Stevia and other similar sugar substitutes won’t work because they lack the bulk and texture needed for this recipe. You’ll be able to make a liquid from stevia and such, but it won’t be thick and creamy. Water – For a different flavor, try coffee or tea. Cocoa mix works well too and gives desserts a nice chocolate flavor. You can also sneak in things like turmeric or other healing herbs by mixing them with the water in the recipe. This works especially well for picky eaters. Butter – You can use a vegan margarine for this recipe. Or try coconut oil, red palm oil, or a sustainably harvested palm oil shortening. This can also be omitted – it’s really just for flavor. Vanilla – Any flavoring will work, but the flavor profile will change. I love making this with lemon or orange extract for a citrus hint. Or you can try rum extract for a bit more decadence. And don’t limit yourself to extracts. I have added a few drops of lavender essential oil to a batch and used it as a base for cookie frosting. Did you know you can take your sweetened condensed milk and heat it to make caramel? One popular method is to place an unopened can of store-bought condensed milk into a pan of water. You then simmer it for a few hours (yep, a few hours) making sure the can is covered with water the entire time. When you’re done, you’ll have a nice creamy caramel. There’s an easier and faster way that won’t use nearly as much energy. Bring the water to a slow boil, stirring the milk the entire time. Continue stirring as the water boils. It should take 20-30 minutes for the caramel to darken and become stiffer. Cool and use as you would any other caramel sauce. Once the caramel forms, you can keep it in the refrigerator for a week or so. When making substitutions, please note that this recipe is for the ingredients and amounts listed. Other ingredients may need to be increased or decreased. Have you made sweetened condensed milk from scratch? Let us know how it turned out! Cows milk is a perfect food for turning little baby cows into 600 pound big cows. It will do the same for you or kill you trying. Wanted to know how many oz of sweetened condensed milk does the recipe make. Making fudge and I need 14 0z. It makes just over a cup, Irene, so you would need to make a double batch. After everything cooks down, it makes just more than a cup, Judy. You can always double or triple the recipe if you need more. Can you make bars with it then freeze them? I have a wedding in a few weeks and am making the cookies, bars ect. thanks in advance! I have tried to freeze bars after using this recipe Angelia, and sometimes they come out sticky after thawing. You might want to try it first before doing a large batch and finding out that it won’t work. Can I just say… THANK YOU! 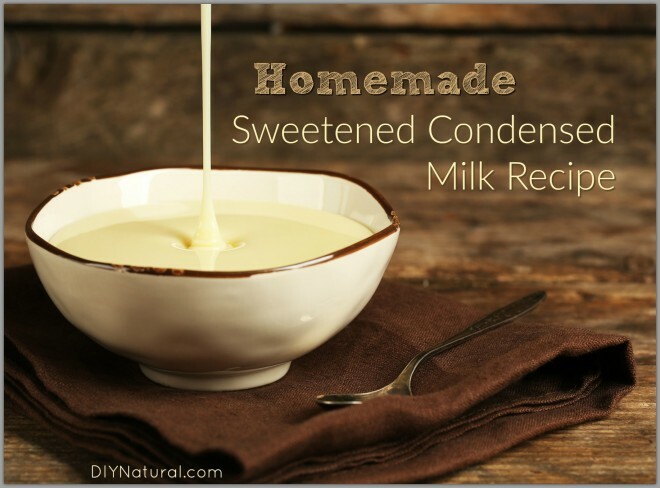 Every once in a while I come across a recipe that uses sweetened condensed milk. It’s generally the only ingredient in the recipe that I can’t find a healthier version for, so I end up passing up the recipe. But now I can try these out when I come across them! No problem, Andresa! I’m glad I could help. I created this recipe for just that reason. Would it be possible to use raw milk intead of the dry milk and water? Yes, you could, Lisa. Just figure out the amount of the dry milk and water combined and use that amount of raw milk.